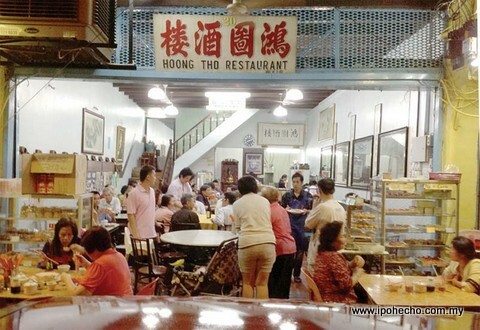 Hoong Tho restaurant was one of the earliest restaurants in Ipoh that I reviewed in March 2009 when I first began writing this food column and also one with the longest heritage surpassed only by Hung Kee in Cowan Street. Imagine my surprise when accepting Dato’ Daniel Tay’s invitation for dinner at Hoong Tho when I discovered its been three and a half years since my last visit. 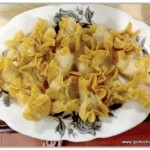 And many new developments have taken place at this ‘Loh Chiew Pai’ meaning ‘old brand name’ since that time. Since taking over from his father in 2010, Andy Onn has given this venerable establishment a facelift and upgraded the whole place. Re-opened since April this year, new toilets have made this restaurant a possible venue for long, lingering dinners with friends where before, one would eat and run! While still a fan-cooled outlet, one giant air-cooler on the ceiling helps to keep the hot humid temperatures at bay. And concomitant with the upgrading of the physical premises, the menu too has undergone a facelift. 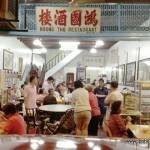 While the traditional dishes for which Hoong Tho is famous – like their Lenggong Fried noodles, their caul-wrapped spring rolls, their Phoenix balls (minced pork, water chestnuts, wrapped around a salted egg yolk), their Wat Dan (which means silky smooth egg) style of noodles with the inimitable sauce, thickened with cornstarch and egg white – are still on the menu, Chef Andy has creatively used Hoong Tho’s traditional recipes and elevated some to culinary heights of Cantonese fine dining. The night of Dato’ Daniel’s dinner, thanks to Eddie Foo, Ipoh’s antiques expert, the menu was pre-ordered (recommended) and presented one dish at a time. 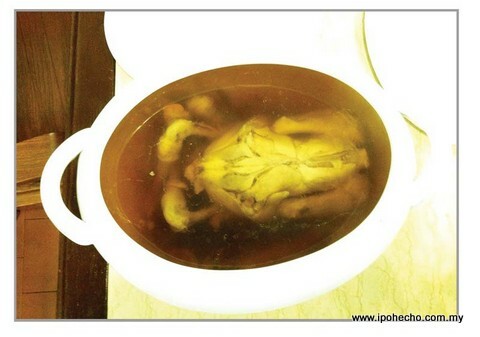 Our first dish was a huge tureen of their steamed chicken soup, prepared according to the ancient Hoong Tho recipe passed down through the generations. This was clear and robust at the same time, the ‘umami’ flavours contributed by not only the chicken but the black dried shitake mushrooms, the dried scallops, the dried octopus and various other special ingredients seasoned with a piece of ginger. Although pricey at RM100, the tureen was enough for double helpings for 10 people. This was followed by a ‘Wat Dan’ fish, a whole pomfret, meat sliced; the bones cut in pieces, battered, and fried to a crunchy crispiness; over flat rice noodles and topped with their famous ‘Wat Dan’ sauce. 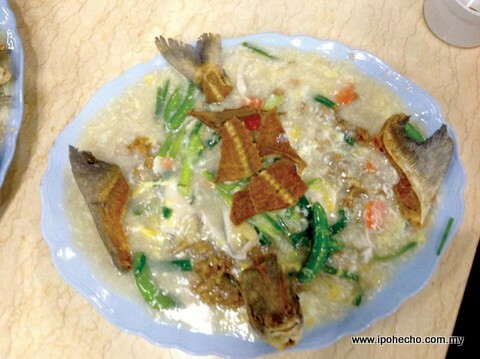 This is an example of the earlier mentioned accolade of elevating basic recipes to culinary heights, where the pomfret was ocean fresh, the meat firm yet tender, the bones lending texture and crunch in juxtaposition to the soft noodles and the silky smooth sauce, fluidly binding all the ingredients into one delectable taste treat. Pomfret being my favourite fish, I found myself in seventh heaven. Seasonal price. 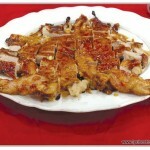 Next to arrive was what looked like a deboned roast chicken, flattened on the plate, with a golden crisp skin. On first bite I discovered that appearances can be deceiving as what I was tasting was minced chicken meat combined with ‘Saito’ or Ikan Belida fish paste, stuffed into the chicken skin and roasted to a golden brown. The contrast of the springy meat ‘farcie’ against the crispiness of the skin topping made for an interesting mouth feel. A lot of preparation work for the Chef but well worth the effort for diners and hence the price of RM50 for the dish. Next on the table was the steamed ‘Saito’ or Ikan Belida fish belly, steamed with Tao Cheo, (fermented bean paste), chilli and garlic. 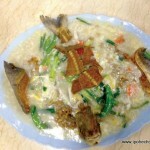 The fish was melt-in-mouth fresh and steamed to perfection. Because the fish is seasonal, it is advisable to order and check for availability. 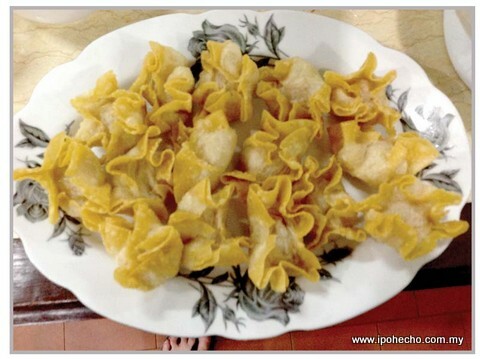 More fish followed in the form of the fried fish paste wonton, a specialty of Hoong Tho and always available. Again this fish paste is homemade from Saito fish, wrapped in wonton skin and deep fried to a crispy crunchiness. RM1.20 each with minimum order of 4 pieces. Of course no dinner ends without something to sweeten the palate and we opted to taste the specialty Cempedak cake, handmade fresh daily by Andy’s sister and is always available for takeaway from the shopfront at RM11 per cake. This turned out to be deliciously moist, oozing with fresh Cempedak, the smaller and with a more pungent aroma than its cousin, the Nangka or Jackfruit. We topped this up with their famous custard, smooth and creamy and not overly sweet, at RM2.50 each. 20 Jalan Bandar Timah, 30000 Ipoh. The civil engineering department of Polytechnic Ungku Omar (PUO), Ipoh introduced its newly incepted permeability test apparatus recently. It was the brainchild of lecturer, Ms Panbarasi Govindasamy. A simple ceremony attended by PUO Assistant Director, Pn Hj Haslina Yusof, staff members and students was held to formalise the introduction. Panbarasi explained her reasons for the innovation. The modified permeability test apparatus, said Panbarasi, was an idea that was on the drawing board for over two decades. The apparatus is an essential item in geotechnical laboratory works. The modifications enhance permeability tests accuracy. Panbarasi attributed her success to her frequent trips to institutions of higher learning such as Universiti Sains Malaysia. She also thanked those who had helped realise her dream. Hajah Haslina expressed her gratitude for the lecturer’s perseverance. The modified test apparatus will help reduce cost, as the polytechnic need not buy new ones. 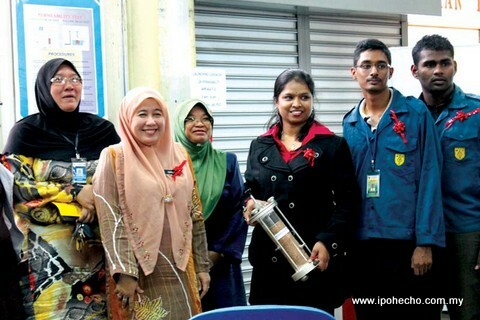 She encouraged other lecturers to emulate Panbarasi’s efforts. Yayasan Bina Upaya Darul Ridzuan (YBU) is embarking on an altruistic effort to educate the less fortunate by forming an education wing known as YBU Education Services Sdn Bhd. The primary objective of this subsidiary is to help poor students in the state to pursue their education to tertiary levels. 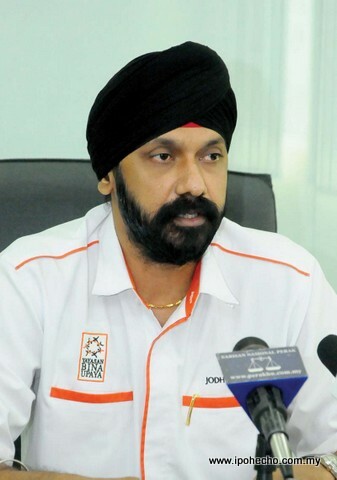 YBU’s Chief Operation Officer, Jodh Singh Dhillon (pic right) said this to Ipoh Echo recently. “The foundation has entered into an agreement with three institutions of higher learning in May as part of our plan to initiate this education programme,” he said. The three institutions are Quest International University Perak, Perak Institute of Technology and TAJ International College. “The Perak Entrepreneur and Skills Development Centre (PESDC) will be incorporated soon,” said Dhillon. The centre provides vocational skill training for successful candidates. Quest University and TAJ College have set an allocated of RM1.5 million and RM500,000 for the programme respectively. The living allowance ranges between RM300 for certificate courses to RM1200 for diploma and degree courses. This is part of the state government’s strategy to improve the living standards of the masses, as provided for under the Gerak Amanjaya initiative started by the Chief Minister, Dato’ Seri DiRaja Dr Zambry Abd Kadir. Quest University offers degree courses in medicine, accounts, finance and business administration. TAJ College, on the other hand, offers diploma courses in electrical engineering and business administration in collaboration with Universiti Teknologi Malaysia and Universiti Teknologi MARA. The Perak Entrepreneur and Skills Development Centre provides vocational-skill training in electronics, welding, air-conditioning and refrigeration. The registration of new students for Year 2013 will begin early next year. “We expect some 200 to 500 to register for the programme,” said Dhillon. Those keen on applying can get details from the foundation’s office at Aras D-2-1, Greentown Square, Jalan Dato’ Seri Ahmad Said, Ipoh or call its office at 05-255 5945/5946. 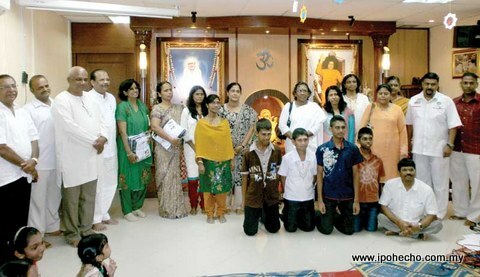 Sathya Sai Baba Centre, Ipoh presented uniforms and shoes to needy students from ten Tamil schools and two welfare homes for children. Representatives from the schools and homes received them on behalf of the students. During the short ceremony, B.P. Prithviraj, Chairman of the Centre, said that for the past 20 years they have been doing this without fail. In addition, they also give monthly provisions to poor families, visit homes for the aged, provide breakfast for poor school children and pay their bus fares and provide free tuition. Their activities are in line with the teaching of their Guru, Sathya Sai Baba, “Love All, Serve All” and “Help Ever, Hurt Never”. The event was made possible through funds raised from the sale of vegetarian food during the Thaipusam festival and donations from members and the public. It may not be the landmark case of the year but the decision by the Tapah magistrate court to acquit and discharge four Orang Asli over the shooting of a tiger in Bukit Tapah Forest Reserve in 2010 was of significance to the Semai community. The four, Yok Mat Bah Chong, 48, Yok Rayau Yok Senian, 50, Yok Kalong Bah Papee, 51, and Hassan Bah Ong, 33, were charged under Section 64A of the Wildlife Protection Act 1972 (Amended 1976 and 1988) which carries a fine of RM15,000 or a five-year jail sentence or both. 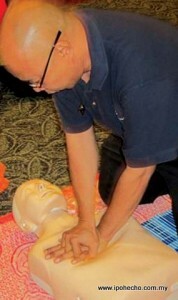 The incident took place in the forest reserve near Sungkai on February 4, 2010. According to Yok Mat, they shot the tiger to save their friend, Yok Meneh Yok Din, who was attacked by the animal while out foraging in the forest. The prosecution, adduced Magistrate Fairuz Adiba Ismail, had failed to prove a prima facie case against the four who hailed from different villages in Sungkai. Based on a 2000 census, the Orang Asli population in Peninsular Malaysia stands at approximately 150,000 or 0.5 per cent of the overall population of the country. They are being divided into three groups, namely Negrito, Senoi and Proto-Malay. The Senoi forms the largest grouping with nearly 55 per cent of the total number. Senoi is concentrated in central peninsula, of which the Semai is the majority with nearly 35,000. 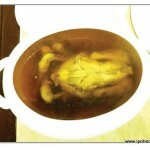 The Semai is found mostly in areas around Sungai Siput in the north to Tanjung Malim in the south. There is also a sizeable population in the Tapah and Cameron Highlands regions. A vital link during the Malayan Emergency (1948 to 1960), they were being courted by both the Communist insurgents and the authorities. The establishment of security posts in the Semai heartland of Cameron Highlands and areas bordering Perak and Kelantan bore testimony to this statement. During my years in the army I had the opportunity to interact with these indigenous people in Post Brooke, Post Telanok and Post Poi. Their naivety and, to a large extent, simplicity are reasons why they have been taken advantage of by the unscrupulous among us. The pillage, unfortunately, continues to this day. For reasons of political expedience, the Orang Asli community has come under intense public scrutiny since the general election of 2008. Legislations related to Orang Asli are the National Land Code 1965, Land Conservation Act 1960, Wildlife Protection Act 1972 (Amended 1976 and 1988), National Parks Act 1980 (Amendment 1983), and most importantly the Aboriginal Peoples Act 1954. The Aboriginal Peoples Act 1954 provides for the setting up and establishment of the Orang Asli Reserve Land. It also includes the power accorded to the Director-General of the Jabatan Hal Ehwal Orang Asli to order Orang Asli out of such reserved land at its discretion, and award compensation to affected people. A landmark case in 2002 was the Sagong Tasi vs. Government of Selangor. It concerned the state using its powers under the 1954 Act to evict Orang Asli from gazetted Orang Asli Reserve Land. 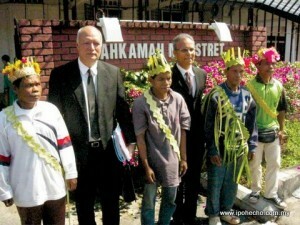 The High Court ruled in favour of Sagong Tasi, who represented the Orang Asli, and was upheld by the Court of Appeal. Although the Tapah court decision on Thursday, October 11 may not be in the same league as the Sagong Tasi case, its significance can never be dismissed. It is, after all, a vindication of sorts for a community long oppressed by the very people entrusted to care for them. It is poetic justice for the four who were doing what their forefathers had been doing before them – eking out a living by foraging in the jungles. The vast jungle tracts, which are slowly but surely shrinking due to human encroachments, are fair game for the powerful and the moneyed, on one side, and the weak and the poor, on the other. It is akin to the confrontation between the Red Indians and the white settlers in 19th century USA. The fact that the quartet was defended by the likeable legal team of Augustine Anthony and Amani William Hunt Abdullah, better known as Bah Tony, a part Semai, lends credence to its importance. Augustine had argued that there had been contradictions in the evidence produced in court. The shotgun, belonging to a Rela personnel, referred to in the ballistic report was different from the one seized from the accused. A Veterinary Services Department officer had told the court that she was the one who performed the autopsy on the dead tiger but an earlier report said that a Wildlife Department officer did the examination. The Rela officer who testified on behalf of the prosecution could not even differentiate one shotgun from another. The victory may be long overdue but more problems are in the offing. The latest being the slapping of Orang Asli students by a Malay teacher for failing to recite the doa during school assembly. PEMUDAH or Pasukan Petugas Khas Permudahcara Perniagaan (Special Task Force to Facilitate Business) is a high-powered task force set up to address bureaucracy in business-government dealings. 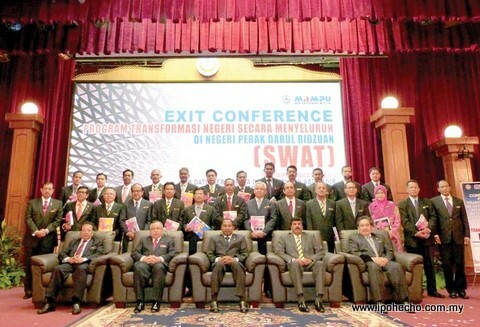 The idea was the brainchild of former Prime Minister, Tun Abdullah Ahmad Badawi, initiated during his annual speech to the civil service in January, 2007. In short, the inception of PEMUDAH was to effect greater improvement in the way government regulates businesses, enhances policies and revamps public sector delivery systems, if and when the need arises. Perak was the first state in Malaysia to establish a state-level PEMUDAH in November 2007, following a proposal by the Federation of Malaysian Manufacturers – FMM (Perak). 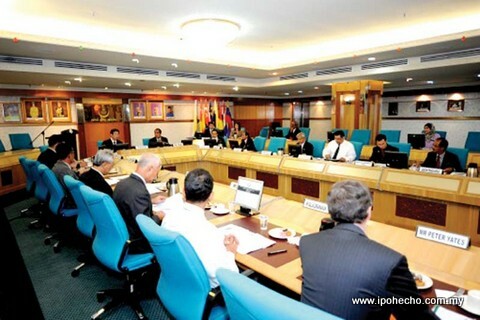 While PEMUDAH Malaysia looks after federal policies, PEMUDAH Perak’s main focus is on state policies, which are sometimes raised to the Federal Government, if necessary. PEMUDAH Perak encourages participation of all district offices, local authorities, government bodies, quasi-government bodies and other regulatory bodies in the state along with the private sector, with the aim of improving the state’s delivery system. Following guidelines from Putrajaya, PEMUDAH Perak also aims to achieve a delivery system for both the public and private sector that is not only customer-oriented but innovative and proactive, as is globally bench-marked. PEMUDAH Perak looks forward to a proactive collaboration between the public and private sectors and supportive governing bodies based on reasonable business terms and conditions. The purpose is to intensify services integrity and create awareness of issues faced by the business community in the state. To review the status of public services delivery system in terms of processes, procedures, laws and human resources and to improve upon these. To benchmark the good practices in the public and private sectors. To co-ordinate and organise programmes amongst public service agencies in order to reinforce the competitiveness of Malaysia, particularly Perak. To address the relevant issues on public sector delivery system raised at State Exco meetings. PEMUDAH Perak is co-chaired by the State Secretary, Dato’ Abdul Puhat bin Mat Nayan, representing the public sector, and FMM (Perak) Chairman, Dato’ Gan Tack Kong, representing the private sector. 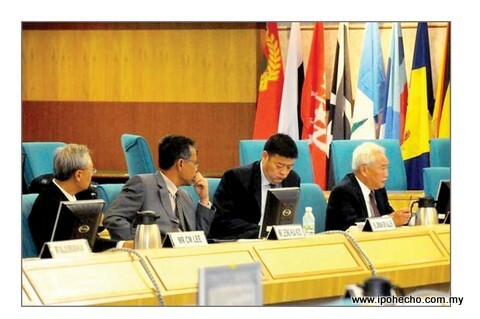 The Secretariat is made up of the State Economic Planning Unit (UPEN) and FMM Perak. It is representative of the composition at federal level where the Chief Secretary and President of FMM (Malaysia) co-chair. Other members include the State Financial Officer, Deputy State Secretary and Ipoh Mayor from the public sector; and Dato’ Francis Lee (REHDA Perak Chairman), Lee Chee Meng (Perak Chinese Chamber of Commerce or PCCCI), Peter Yates (CEO Carsem), Chairman Leong Hua Kooi of Malaysian International Chamber of Commerce and Industry (MICCI) Perak chapter and Dato’ Muhammad Muhiyuddin (Perak Malay Chamber of Commerce), among others from the private sector. The committee meets bimonthly on the first Friday of even months. In 2011, PEMUDAH Perak underwent a major restructuring exercise. A drastic move was taken to open up membership to individual companies, instead of just business associations and chambers in Perak. A seventh focus group has been proposed – Security (encompassing both physical and online threats). These focus groups are jointly chaired by representatives from both the public and private sectors, all of whom are members of PEMUDAH Perak. Co-chairman of PEMUDAH Perak, Dato’ Gan Tack Kong, is happy that the newly revamped task force is finally meeting its objectives and resolving issues. PEMUDAH, in general, uses the global index of “Ease of Doing Business” by the World Bank Group as a benchmark to check on the level of ease to conduct business in the country. Malaysia ranked 23 out of 183 economies indexed in 2011 but jumped five positions in 2012 to rank at number 18. PEMUDAH Perak refers to key indicators set by the World Bank Group to improve on the ease of doing business at state level. These indicators include starting a business, dealing with construction permits, getting electricity supply, registering property, getting credit, protecting investors, taxes, cross-border trading, enforcing contracts and resolving insolvency. According to Dato’ Gan, initially it was tough going for PEMUDAH Perak and the mechanism of streamlining the delivery system in the state was slow, as there was no proper system in place. “It wasn’t easy to change the mindset of those in the public service to see why a revamp was required,” he said. However, the task force has been receiving full co-operation from the State Government since Dato’ Abdul Puhat, the new State Secretary came on board in December 2011. While addressing state policies is a manageable task, decisions that involve Federal Government policies are still difficult to reach. “One major difficulty is seeking Federal allocation for state projects,” said Gan. The plight of the Perak Pottery Association, which is currently facing an energy crisis, is of major concern to PEMUDAH Perak. Businesses in the pottery industry are grossly affected by the inability to procure good quality fuel at a reasonable price. As a result, some companies folded as they were unable to sustain their business due to the rising cost of fuel. The Ceramic Park Industrial Area in Chepor, which was once only open to those in the ceramics business, is now occupied by businesses from other sectors as well. Hence, the park is now home to a mixed industry, which was not the original intention. The problem faced by the Perak Pottery Association affects the whole country as nearly 80 per cent of ceramic products in the country are manufactured in Perak. The focus group on Human Resources proposes to establish a One-Stop-Centre (OSC), probably at the Immigration Department in Meru Raya. This is to facilitate the recruitment of foreign labour. Companies are currently forced to make countless trips to Putrajaya to process permits to hire foreign employees. The focus group on Permits and Licensing, headed by Ipoh Mayor, Dato’ Hj Roshidi Hashim and Dato’ Francis Lee (REDHA Perak Chairman), has proposed that the lengthy licensing procedures be streamlined and checklists shortened. 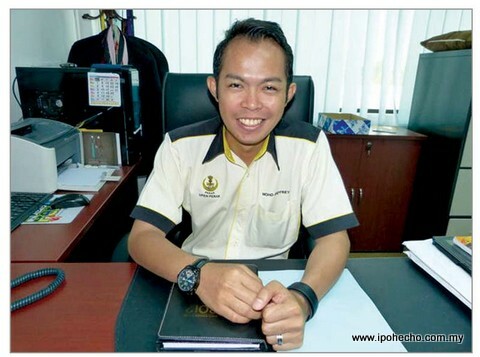 The Ipoh City Council has been tasked to provide the benchmark for other local councils to follow. Since its establishment in November 2007, PEMUDAH Perak has reduced the cost of doing business and enhanced trade and business opportunities in the state, besides improving the public delivery system. 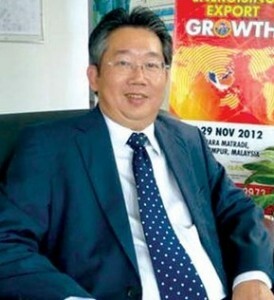 Issues resolved include the speeding up of AP approval for the export of rock materials under the Ministry of Natural Resources and Environment, speeding up the renewal application of mining lease for Kaolin (M) Sdn Bhd, which had been pending for two years and the establishment of the State IPMC (Industrial Park Management Committee). Dato’ Gan is particularly proud of IPMC’s performance thus far, especially in the districts of Ipoh, Taiping, Manjung, Tapah, Gerik, Kerian, Teluk Intan and Batu Gajah. Each committee is required to meet four times a year to address infrastructure issues that may crop up in their respective industrial estates. Local councils have been utilising the IPMC platform to lobby for Federal grants through Malaysian Investment Development Authority (MIDA). Shining examples would be the Federal grant disbursed to industrial parks in Perak under the 10th Malaysia Plan (2011-2015). Tasek Industrial Estate in Ipoh received RM3.1 million for the upgrading of road and drainage, the Ceramic Park Industrial Area in Chepor received RM1.8 million for road works, while Kamunting Raya Industrial Estate in Taiping received RM3.4 million for road and drainage works. With IPMC in place, PEMUDAH Perak is able to, within the shortest period of time, identify industrial land that has been left idle, and link these to interested investors quickly. This saves potential investors time and money. On a more basic level, the approval of “Halal” certificates now requires only one month compared to three months previously, while land registration with the Office of Land and Mines now takes only one working day. Even though the main objective of PEMUDAH, at both national and state levels, is to facilitate business, PEMUDAH Perak welcomes feedback from the general public on issues pertaining to streamlining of delivery systems in the public sector. Mohd Jaffrey b Mohd Zainol, the Assistant Director for Investment and Industry at the State Economic Planning Unit, who also leads the Secretariat of PEMUDAH Perak, pointed out that one of the challenges faced by the task force is the lack of input from the public. Go to http://www.perak.gov.my/index.php/component/content/article?id=188 for your complaint form (E-Aduan). 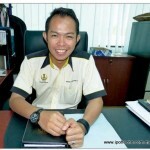 This E-Aduan system is part of PEMUDAH Perak’s plan to move all paperwork online. Jaffrey hopes to see one-stop centres (similar to MBI’s) being established at all local councils. In time, the public sector will be setting a benchmark for the private sector to follow. The private sector, incidentally, has been very supportive in this aspect. “The proactive stance adopted by the business fraternity is simply remarkable,” he concluded. The annual Perak Home Exposition (Homex), one of the biggest in northern Malaysia, will be back for the third consecutive year. The exposition is jointly organised by the Perak Furniture Makers’ and Dealers’ Associations and is endorsed by the Perak State Government and Ipoh City Council. 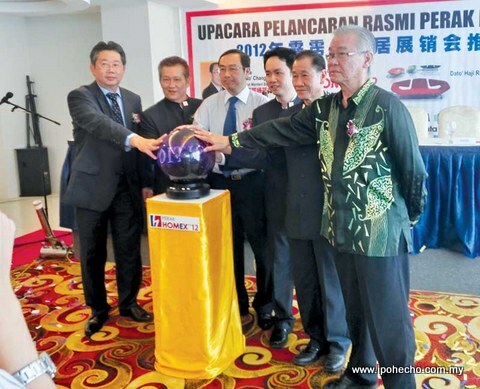 Its other supporters are the Perak Chinese Chamber of Commerce and Industry, Federation of Malaysian Manufacturers (Perak Branch), Perak Real Estate and Housing Developers’ Association (REHDA), Perak Electrical and Radio Dealers’ Association and others in the furniture industry. The exposition will bring together manufacturers and buyers so they can compare prices and qualities of the products on display. A formal launch of the event was held at a prominent hotel in the city recently. Last year, the exposition attracted some 60,000 visitors with a turnover of RM10 million. This year, the organisers have room for over a hundred exhibitors. They will operate from 300 booths, offering the latest household products, electrical appliances, furniture and many more. Rebates and discounts will be offered. Visitors stand to win attractive prizes in lucky draws held during the duration of the show. The quality of products from Perak is equivalent to that of other countries. 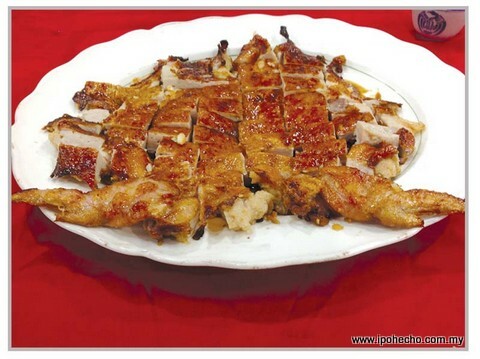 Although China is famous for its cheap prices, the quality does not match our local products. However, Malaysian products are still not known by many. 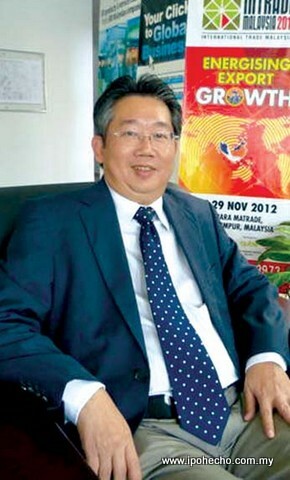 Therefore, the objective of Perak Homex is to open the eyes of markets in East Asia such as Korea, Japan and China. Malaysia currently exports over RM7 billion worth of finished products to USA and Japan annually. Perak Homex 2012 will be held at Stadium Indera Mulia, Ipoh beginning Thursday, December 6 till Sunday, December 9. Opening time is between 10am to 10pm daily. Call Ms Susan Hoh at 019-526 0187 or 05-243 9608 for details or visit: www.perakhomex.com.my. 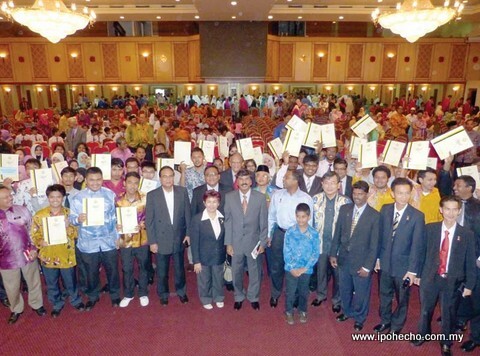 A total of 615 students from 50 institutes of higher learning, 17 private and 33 public, received higher education loans during a ceremony at the banquet hall of the State Secretariat Building, Ipoh recently. Study loans have been disbursed in Perak since 1973. This year’s allocation by the state government stands at RM5 million. The students qualified for the loan, which they applied online for the 2012/2013 term after fulfilling a number of criteria. The RM5 million is part of the Perak Amanjaya 2015 vision to develop human capital. The minimum amount, which is interest-free, is RM5000 for a diploma course. Students who graduate with first-class honours can apply for a waiver, and if approved, will have their loans converted into scholarships. Those who repay their loans in one lump sum will enjoy a 30 per cent rebate. Chief Minister Dato’ Seri Dr Zambry Abd Kadir related stories of struggles faced by parents in putting their children through education. He then witnessed the handover of cheques to the students.